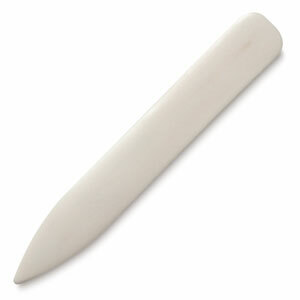 A Bone Folder - is a small hand held scrapbooking tool for enhancing creases in paper. It is highly polished and smooth and will not damage the materials you are trying to score, crease or fold. Again, not a necessary tool, but nice to have if you want to have some perfection in your folds. Your thumb nail also works good here if you don't have too much folding to do. They are used to fold, crease and score paper, but with sufficient (or excessive) pressure the edges are sharp enough to actually to cut paper. These cuts can be either accidental or on-purpose, so if you are using the pointed or sharp edge, please be careful to avoid an unplanned cut. We have recently added the Bone Folder Store for you to purchase a Bone Folder like the ones shown on this page or to get an idea of what else is available. The Store is at the bottom of this page. Try to keep the folder clean and free of glue so it continues to slide and burnish as it's supposed it without scratching, tearing or other wise damaging your paper. Smooth-edged tools for making precise creases in paper, embossing, and burnishing — invaluable for fibrous and heavy decorative papers. All three are made with real bone. Sometimes when using a bone folder, it's a good idea to put a piece of smooth paper between the folder and the craft paper you are working on as it could prevent your good paper, specifically papers with a matte finish, from becoming shiny. It is also a nice tool to use to burnish rub-ons. Rub-ons are either fonts or graphics that are sticky on the back like a sticker would be, but they are applied by burnishing the top of the rub-on to make the back of it stick to the paper. You can use either a popsicle stick, stylus or the rounded side of a bone folder. It works great for smoothing out the air bubbles that sometimes get caught underneath stickers. If you want you make cards, which is a great way to use up any left over scraps of paper you may have, it's nice to have the folder to make the creases appear crisp and clean. Also nice to use for starting a crease by holding the pointed end down on the paper where you want the crease to start and folding the paper over the tool. Scrapbookers and paper crafters are now starting to make their own books, and getting great sharp creases in the signatures for the book pages is critical to a professional looking book. Also good for the covers of hand made books, it's great for smoothing out the back and front cover papers after they have been glued together. A must have for professional looking books. There are certain other paper crafts like Iris Folding, Origami and Kirigami that it can be used with. 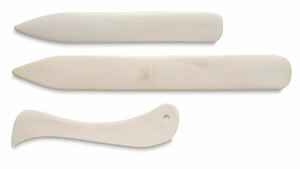 Synthetic bone folders are available made from plastic and Teflon. Typically, the original ones were made from the leg of a cow, deer, or elk. They can be purchased at any craft or scrapbooking store for just a few dollars. Below is the Bone Folder Store where you can purchase one right now.